Marijuana spent this year finding its feet. It may spend next year surfing a big wave of profits. Marijuana 1.0 was all about the legalization drive, the dumping of billions of dollars of cash into the industry and mouthwatering, legitimizing mergers and consolidations—but it was a jockeying exercise in capacity expansion. Marijuana 2.0 could be just as big a deal—it’s about the technological tweaks that will actually make this industry profitable. 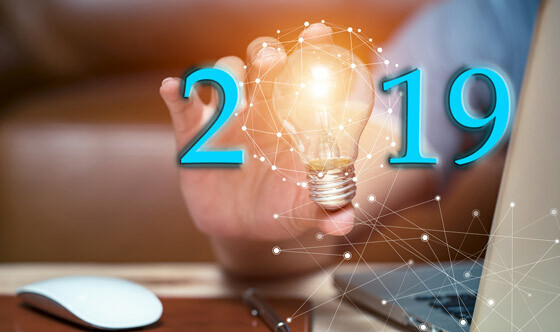 It involves Big Data, AI, automation and a host of other tech tweaks that will increase profitability and open up vast new markets in key verticals. That includes everything from recreational use and OTC pain and sleep relief to pharmaceuticals and beauty/nutraceuticals. Wall Street’s top marijuana expert has predicted explosive growth for the industry eventually reaching $500 billion. Only the most efficient and competitive cannabis players will thrive under the coming Big Data and AI revolution. And one little-known company has already developed an efficient, high-quality, low-cost automated mass production operation. The little-known company is the Wayland Group (WAYL.CN, OTC:MRRCF), and it’s positioning itself to be the “Vertical Integrator of Cannabis”. And for now, it remains “little-known” because just as early investors failed to understand that Amazon was a technology company first and a retail operation second … the same thing could unfold in the cannabis sector. Everything is about the tech—and Marijuana 2.0 will prove that. Wayland is a “tech first” $250-million market-cap company armed with a war chest of patented technologies that can reshape the marijuana industry in 2019. Being a relatively new industry, the cannabis space suffers from a severe shortage of credible, evidence-based data and a major void of automation tools. As a result, most companies have been relying on gut-feeling to run their operations – leading to high operational inefficiencies and high costs. Wayland Group (WAYL.CN, OTC:MRRCF) is a medical cannabis company that’s positioning itself as the industry’s ultra-efficient manufacturer of CBD and CBD products by automating its upstream and downstream operations. The company has partnered with Rockwell Automation (NYSE:ROK) to develop a connected and scalable platform that seamlessly connects its cultivation facilities for a consistent and high-yield crop. Wayland employs Rockwell’s new exclusive agriculture platform from AI Data Grow with its hardware, Automation FactoryTalk software and Ethernet/IP network connectivity to streamline communication between traditional silos such as process control functions, material handling and building automation. This connected and scalable system provides a single, integrated platform for predictive AI, environmental monitoring, process automation and building management. Through this innovative platform, the company is able to monitor and control all the variables required for the growing of medicinal cannabis, including capturing the ideal nutrient mix, humidity, temperature and light cycles to produce a consistently high-quality and high-yield crop regardless of changing weather conditions. The unified platform is highly scalable and expandable, thus allowing the company to seamlessly replicate a bolt-on solution and facilitate rapid growth. This improves asset utilization, shortens time-to-market and lowers costs. The system is the industry’s first large-scale integration in the medical cannabis industry and transfers Rockwell’s immense expertise in life sciences to the medical cannabis industry. Additionally, Wayland is integrating Oracle’s ERP with Rockwell and AI Data Grow’s platform to have full visibility and control from the factory floor to the executive suite. Wayland’s automation drive has earned it various industry accolades including the Good Manufacturing Practice (GMP) rating, becoming one of only 5 EU GMP-certified producers that can sell directly to the EU market. That’s remarkable for a $250-million company, with the others being the industry’s big fish: Tilray, Canopy, Cronos and Aurora. The big craze about the company’s automation platform is this: It makes cannabis production energy efficient and introduces lower labor costs. That removes two ominous bogeymen for the sector. Utilizing FactoryTalk energy metrics, Wayland is able to optimize its carbon footprint by controlling fans, lights and other environmental specifications such as temperature, lighting, humidity, fertigation and carbon dioxide to achieve a 90 percent-plus energy efficiency rating (EER). Some of its key milestones include onsite natural gas cogeneration facilities and state-of-the-art water filters that recycle water leading to losses of just 10,000 liters per year. Automation enables the company to replace ergonomically challenging and labor-intensive jobs with advanced operators with higher skills sets. This creates a lower headcount with higher pay grade and thus addresses a major hurdle in agriculture agronomics. The company has fully automated its Canadian operations, and now needs only 26 employees as opposed to 500 before the exercise. At 14 dollars an hour minimum wage in Ontario, those savings quickly add up. It’s a high-cost-savings bar that other producers struggle to match. Wayland (WAYL.CN, OTC:MRRCF) is now able to leverage its innovative automation machine using another clever trick—by only targeting growing regions and markets that will likely provide high returns and profits. Regions like Argentina and Columbia where production costs are low … and markets like Switzerland, Germany and the EU where cannabis products fetch attractive prices. Wayland is now selling CBD at CAD$16 per gram in Europe compared to prices as low as $5.65 in Canada. With production costs in in Argentina and Columbia as low as 5 cents per gram for CBD, there is a massive profit opportunity if South American CBD were to be sold in Canada. Even the Canadian region has become highly profitable for the company thanks to its full-on automation. Wayland (WAYL.CN, OTC:MRRCF) has brought the best of the pharmaceutical world to the marijuana industry by integrating Vesisorb technology across its product portfolio–thus enhancing rapid absorption and predictable dosing. Vesisorb is a patented product applied to fat-soluble formulations leading to as much as 622 percent increase in bioavailability. CBD molecules are oily in nature and tend to clump together upon ingestion. This interferes with absorption and can lead to unpredictable effects. 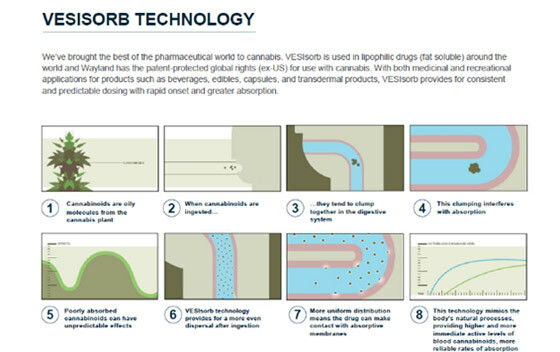 Vesisorb resolves that by improving dispersion of CBD molecules and ensure uniform absorption. Wayland has the patented-protected global rights (ex-U.S.) for use of Vesisorb with cannabis. Wayland has also developed a range of CBD brands to cater to buyers of different ages, genders, needs and occasions. Each brand projects a unique feel and image making it easy and intuitive for customers to make their pick in a potentially confusing industry. Marijuana consumers no longer fit the old stereotype of bored people simply trying to escape their crushing suburban ennui. Wayland has created a range of high-quality products for the sophisticated consumer, with brands like Solari–designed to provide the best holistic and health benefits that CBD can offer, while Kiwi is perfectly balanced to appeal to new or light users. Wayland’s (WAYL.CN, OTC:MRRCF) advisory board is a Who’s Who of Big Pharma and Silicon-Valley-style tech gurus—and its management team is headed by a similarly powerful line-up of pharma-tech figures from the CEO and chairman to the CFO and president. The board pulls from the best and brightest at NASA Jet Propulsion Labs (JPL) and Lockheed Martin, among others. All the industry bases are covered, with a massive nod to high-tech and pharma. Wayland President Terry Fretz is a veteran pharmaceutical exec with two privately held generic pharma companies under his belt that were the fastest-growing in Canada and acquired by publicly traded multinationals. CFO Scott Langille has over 30 years of experience in the pharmaceutical industry in both Canada and the United States, holding executive positions at publicly traded pharma companies including Tribute Pharmaceuticals, and Virexx Medical Corp. The advisory board includes everyone from Hilti Tools empire heir apparent Rudolph Hilti, Prof. Dr. Markus Backmund MD, PhD—the chair of the German Society of Addiction Medicine, and Dr. Horst Schiessl, on the supervisory board of Baader Bank AG, to Dr. Hans Dendl, former chairman of AOK Health and researcher at NASA Jet Propulsion Laboratory and Lockheed Martin Aeronautical Research. To fully capitalize on its growing moat, Wayland (WAYL.CN, OTC:MRRCF) plans to rapidly ramp up production in its key markets. 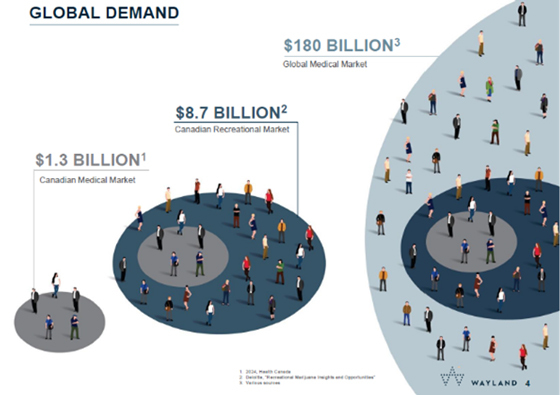 From a projected 2,400 kilos of CBD in the current year, it’s eyeing a run-rate of 95,000 kilos per annum by Q4 2019 in Canada alone. The company expects similar sharp ramps elsewhere— boosting dry cannabis for CBD extraction in both Switzerland and Germany. And, this will show where it counts most…the bottom line. But the best part of the story: the company says it’s already made massive infrastructural investments to yield free cash flow for the coming years. Marijuana 2.0 is a tech game above all, and this little-known company has been quietly developing the tech this industry needs to turn hype into profit and to make good on the industry’s desperation to expand capacity to meet demand. That’s exactly what will define 2019 for pot, and the high times will be on the back of the right tech, rolling the right margins.